You know you’re playing well when your opponent starts swearing in German. It’s even more obvious when you get him to trip on his own two feet. The magical play of No. 40 Billy Griffith and No. 17 Andre Goransson set the tone for the No. 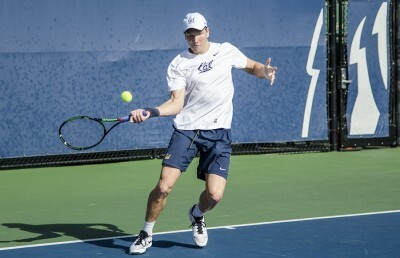 16 Cal (11-3, 2-0 Pac-12) men’s tennis team’s 4-0 victory over San Diego State on Tuesday. The Bears have now won three straight matches in the span of five days, with victories over Utah and Arizona over the weekend. With No. 28 Florian Lakat sitting out again, Griffith played on court No. 1 at home for the first time ever. Griffith showed the poise necessary to play as the No. 1 singles player, defeating No. 112 Freddy Gelbrich in straight sets, 6-3, 6-1. 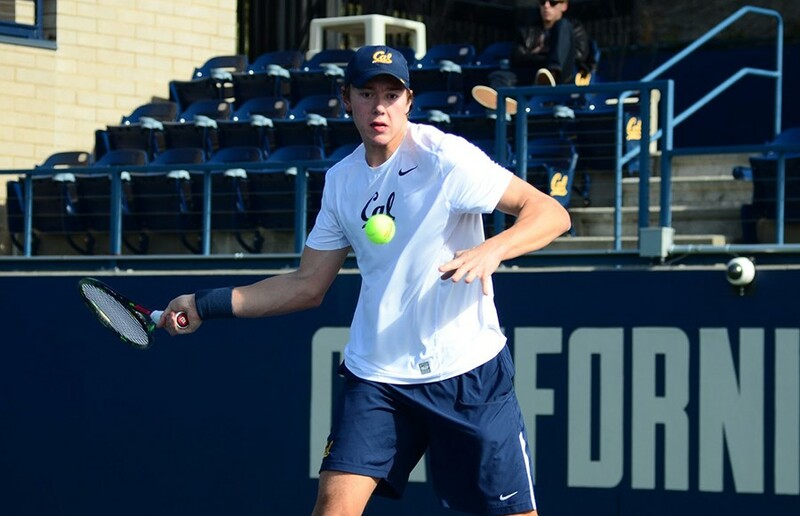 Despite a strong fall season, including reaching the finals of the USTA/ITA Indoor Intercollegiate Championships, Goransson has recently been in a slump, dropping to No. 17 in the rankings. Goransson, however, got back on track Tuesday, quickly disposing of Hendrik Jebens, 6-1, 6-2. With Filip Bergevi and Lakat sitting out, freshmen Gunther Matta and Ryan Shen instead saw action Tuesday. Matta claimed the doubles point with partner Oskar Wikberg, while Shen led his opponent in his first singles dual match of the year before it was abandoned. Sophomore J.T. 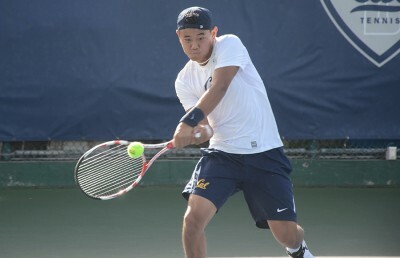 Nishimura clinched the match for the Bears, defeating Sanders Gjoels-Andersen on court four. The Bears’ return home will be a brief stay, however, as they travel to Southern California to face No. 9 USC (11-4, 1-1) on Friday and No. 5 UCLA (14-2, 2-0) on Saturday. USC is coming off a road split losing to Washington but pulling out a come-from-behind victory against Oregon. The Trojans have now won four of their last five, all on the road, and will be playing at home for the first time in more than a month. After reaching the NCAA quarterfinals last season, USC has several new faces helping lead the way this year. Freshmen No. 58 Logan Smith and No. 109 Jake Devine have adjusted well to the collegiate level, while freshman Laurens Verboven and partner Nick Crystal rank 38th in doubles. The veterans of the team are dominant as well, with senior No. 25 Max De Vroome and juniors No. 55 Crystal and No. 99 Connor Farren rounding out a formidable USC squad. Meanwhile, UCLA is on a roll, having won seven straight matches. Coming off dominating wins against Washington and Oregon to start Pac-12 play, the Bruins have proven themselves to be one of the premier teams in the nation. UCLA is led by No. 9 Mackenzie McDonald, last year’s Pac-12 Player of the Year and Singles All-American. This spring, McDonald is back at it again with a 6-1 record against ranked opponents, his lone loss coming against then-No. 11 Ryan Shane from Virginia. Like the Bears, the Bruins also boast a deep roster with four nationally ranked players in McDonald, No. 41 Gage Brymer, No. 49 Martin Redlicki and No. 98 Karue Sell. Sell has yet to lose this season with an undefeated record in dual matches. In doubles, the pairing of McDonald and Redlicki is currently ranked fourth in the nation.